To the challenge of being TV’s most prominent woman on the late-night landscape, Samantha Bee spent the debut episode of Full Frontal making that challenge irrelevant or glorious — take your pick. Her half-hour was packed with jokes, a high percentage of which arrived with the kind of cutting political edge audiences have been yearning for since Stephen Colbert and Jon Stewart abandoned Comedy Central. Bee’s opening monologue — a stand-up affair, with deft use of illustrative clips — hit at the false humility of Hillary Clinton and moved on to what she called the “banquet of all-you-can-eat-crazy” that was Saturday’s New Hampshire debate. (I could have done without the Bernie Sanders-is-old ageism, but that’s a mild quibble.) I feel it’s safe to say that Bee is the only late-night host who will heap the appropriate amount of hilariously vicious scorn upon Marco Rubio’s extraordinarily underreported and inaccurate-verging-on-evil interpretation of Clinton’s position on abortion. Later, Bee introduced a taped piece in which she did not appear, yet which nevertheless extended her point of view forcefully. It followed Jeb Bush on the campaign trail, and was shot like an Ingmar Bergman film, all dour bleakness and despair, featuring Werner Herzog-like droning narration. The film approached everyone from Bush supporters to a luckless young man who reports for “The Huffington Post, which is almost like a journalistic organization,” the narrator delightfully observed. The interviewees’ inability to articulate the appeal of Bush was like a piece of found-comedy — except it takes artistry to make something this funny appear to be merely found. Bee’s point of view is essentially a kind of savage humanism, in which a description of Heidi Cruz as “Ted Cruz’s wife-and-possible-hostage” is at once cutting and sympathetic. If Bee can sustain the tone she presented in this premiere episode, Full Frontal is going to be an exhilarating pleasure. 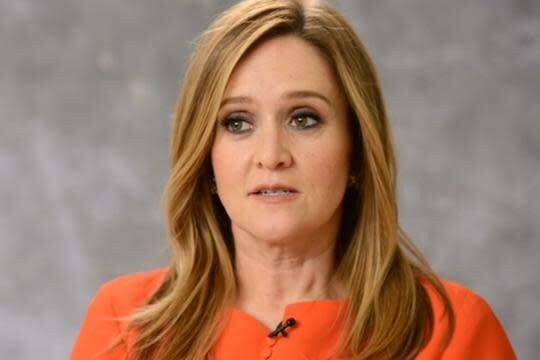 Full Frontal With Samantha Bee airs Mondays at 10:30 p.m. on TBS.